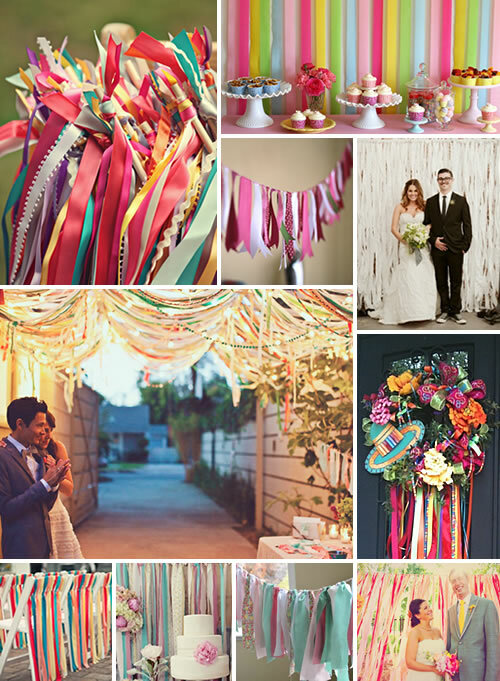 This inspiration board is all about using ribbons in a different way. Decorating wedding venues with them, rather than just using ribbons for small things like favours. They can be used to decorate your venue or ceremony instead of traditional bunting. Ribbons come in every colour imaginable, different widths, types of fabric, patterns and even polka dots. If you are having a bright and colourful colour scheme, you could use satin ribbons in strong colours to add a fun contemporary feel. For a vintage looking wedding theme, pick muted shades and use some sheer ribbons as well as satin and mix in different widths. You could also add some lace ribbons and maybe some pearls garlands. Instead of chair covers you could tie ribbon streamers to the back of your chairs. Ribbon streamers look pretty hanging from door wreaths too, place them at the entrance to your church or venue. Ribbon wands are fun alternative to confetti, for your guests to wave as you leave the ceremony. They are also perfect if you are not allowed to use real confetti at your venue, and children will love them. You can use ribbons to create a backdrop for focal areas to you want highlight, or any spots you just want to pretty up a little. You can also use strips of fabric or crepe paper to create backdrops. 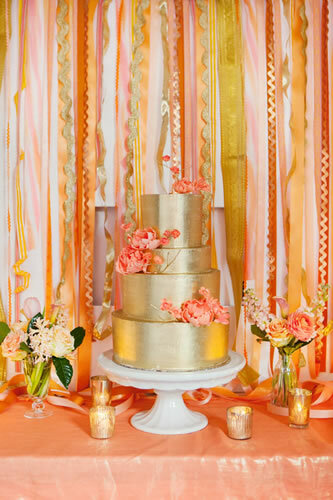 Sweet tables look great in front of a curtain of ribbons, match them to the colours of your cakes and sweets. A canopy of ribbons looks stunning hung from the ceiling. The canopy on the inspiration board has been lit from above with fairy lights for a warm glow in the evening.